Troi File Plug-in is a very powerful tool for getting access to information outside the FileMaker database. Any files stored on the rest of the computer can be accessed through the functions of the plug‑in. manage your images and movies: get images and their metadata (IPTC, Exif, GPS, XML) inside your FileMaker database and write IPTC and Exif metadata too! Troi File Plug-in adds 77 functions to FileMaker, giving you virtually limitless possibilities! Starting with FileMaker 16 plug-ins can also add script steps. In File Plug-in version 10 you will find 37 functions which perform an action as script steps. You can select these script steps in the script steps pane in Script Workspace, or you can begin typing the script step name, then choose the script step from the list that appears. The script steps significantly expand the possible actions you can perform with FileMaker. 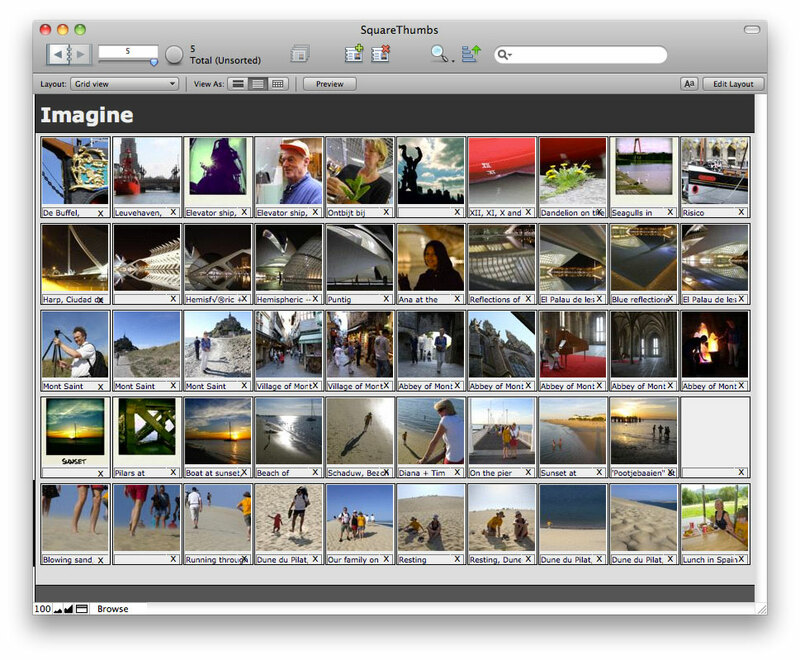 Troi File Plug-in allows you to retrieve extensive image and movie data like width, height and depth, and much more. While we were at it we also added an extensive example file ManageMedia.fmp12. 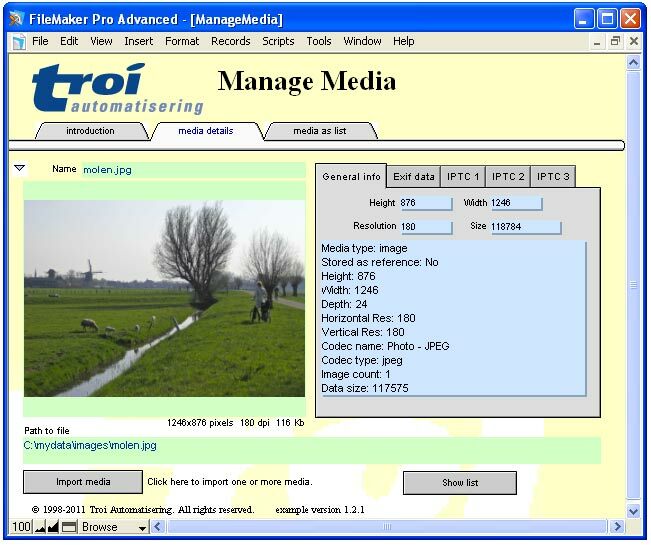 This example file combines some of the Troi File Plug-in’s functions to create a powerful Media Manager for images and movies. It shows how to import one or multiple images and/or movies from a folder. It also retrieves a wealth of metadata like width and height, IPTC metadata (amongst others caption, description, keywords, copyright), GPS, XMP and Exif metadata. Exif metadata is information about the time a photo was taken, aperture, shutter speed and the like. And did we mention the example file also works with movie files? With Troi File Plug-in you can write EXIF and IPTC metadata information to your image files. By using the “-SetImageURL” switch you can set the Photoshop Image URL metadata (not part of the official IPTC specification). The “-UTF8CharSet” switch can be used together with the “-SetIPTC” and “-SetEXIF” switch. This will write the metadata encoded as UTF-8 text and will set the CodedCharacterSet tag in the written image file (which indicates the encoding) to UTF-8. The plug-in’s ExchangeFiles function lets you quickly exchange two files that are stored on your disk. Very handy when updating existing files: work in a draft version first and when your draft is ready, replace the original file with just one script step. Also works when the files are located on different disks! The plug-in’s CreateAlias function lets you create an alias file (or shortcut) from a source file or source folder. Resolving an alias file is easy with the ResolveAlias function. It returns the path to the destination of the alias file. If the alias is broken you can use the switch “-ReturnLastKnownPath” to get the last path the alias pointed to. The plug-in’s CreateZip function lets you create a compressed archive of files and folders. Expanding ZIP files is easy with the UnZip function. You can specify the folder where the unzipped items need to be placed. The GetZipInfo function lists the items (files and folders) inside a ZIP file. This allows you to check what’s inside a ZIP file before you unzip it, so no unwanted overwriting of existing items occurs. Troi File Plug-in lets you recursively list the contents of a folder with one call to the plug-in. The plug-in will return a list of all files and/or folders and all the subfolders contained in the folder you are listing. This makes processing all the items in a deeply nested folder very easy, like for example listing all the Word documents contained in a folder. On macOS you can optionally even list the internal contents of a package folder (like for example a macOS app). Troi File Plug-in can substitute text in and append text to an external (text) file. You can search for a text string in a file and substitute it with another text. You can substitute text and have the result saved in the same file! And you can use replace strings of up to 150,000,000 characters, making it possible to substitute tags with much longer replacements in template files. With the function TrFile_InsertContents, you can insert text into a file at a specified position. The GetIcon function gets the icon of a file. It can create icons in sizes varying from 16×16 to 1024×1024 pixels and with double resolution, which is great for retina screens. With Troi File Plug-in you can create thumbnails of your image files in any size, including square thumbnails, which is great for presenting multiple images to a user in a compact grid. We have added a grid view to the Thumbnail example file, which demonstrates (in a simplified way) how to do this. We also added the possibility to add a name when creating a thumbnail with the TrFile_CreateThumbnail function. The name is normally not visible, but will be used for example when you perform an Export Field Contents action later. Another feature is the possibility to make thumbnails in the PNG format, with an alpha channel. This means that the thumbnail will have the same transparent areas as the original image. The function TrFile_GetTypeOfItem provides an easy way to see if a path points to a folder, file or package folder (macOS). It can also indicate if a file is an alias file (or shortcut on Windows). The TrFile_GetDateCreated and TrFile_GetDateModified functions and their variants, like TrFile_GetTimestampModified, will get the creation and modification date of a file or a folder. Moreover, you can also set the creation and modification date of a file or folder, using the TrFile_SetTimestampCreated and TrFile_SetTimestampModified functions. Troi File Plug-in allows you to drag one or more files or folders on a FileMaker window or even a drop zone. The paths of the dropped items can then be handled by a triggered script, for example to put them in a container field. You can specify up to three drag destination rectangles (even on the same window), and each drag can trigger a different script. The drag and drop functionality includes Mail Drop (macOS only). You can drag one or more emails from the Mail.app to the FileMaker window. Add the switch “-AllowMailDrops” to the switches parameter of TrFile_DragAndDrop function to enable this extra functionality. The DragAndDrop example file reflects the Mail Drop functionality with an extensive example demonstrating the handling of single and multiple Mail Drops. With the TrFile_ExecuteShell function you can execute a command in the command shell of the operating system. On macOS this will be a command executed in the UNIX Bash shell, and on Windows this is the Windows CMD shell. You are free and invited to test the plug-in before you pay. Troi File Plug-in is fully functional in demo mode, it will only stop working after 2 hours of testing. Download your copy here. Troi File Plug-in 10.2 is a bug fix release, which now also loads again on Windows 7. This version also improves the TrFile_GetMetaData function with the switches “-GetImageDescription” and “-GetMovieDescription” on 32-bit Windows. This functionality now works for most image and movie formats without QuickTime installed. On macOS we improved the TrFile_CreateThumbnail function and the Create Thumbnail script step: you can now create thumbnails of Photoshop files (with extension .psd). Please see the Version history below for a complete list of changes and improvements in this and earlier versions. Upgrading to version 10.2 is free for all users of version 10.0 and 10.1. (Windows; 32-bit) Modernized the code when using the TrFile_GetMetaData function with the switches “-GetImageDescription” and “-GetMovieDescription”. This functionality now works for most image and movie formats without QuickTime installed. (macOS) Improved TrFile_CreateThumbnail function and the “Create Thumbnail” script step: you can now create thumbnails of Photoshop files (with extension .psd). Fixed a problem in the TrFile_CreateThumbnail function and the “Create Thumbnail” script step: the plug-in no longer returns error code $$-8994 (noThumbnailFoundErr) instead of the expected error code $$-2003 (cantFindHandler) when no thumbnail could be created. Improved the TrFile_GetMetaData function with the switch “-GetEXIF”. The plug-in now returns the WindowsXP EXIF tags correctly. Improved the TrFile_SetMetaData function with the switch “-SetEXIF”. You can now write EXIF data with WindowsXP EXIF tags. Improved the TrFile_GetMetaData function with the switch “-GetEXIF”. You can now get EXIF with UTF-8 encoded strings using the switch “-SourceUTF8Charset”. Improved the TrFile_SetMetaData function with the switch “-SetEXIF”. You can now write EXIF with encoded UTF-8 strings by adding the switch “-UTF8Charset”. Improved the GetStructure.fmp12 file: it now shows a dialog when trying the TrFile_GetFileStructure function with a (old!) QuickTime movie that has its MOOV atom in a resource fork. Note that the TrFile_GetFileStructure currently does not support MOOV atom in a resource fork. Improved the All File Examples.fmp12 file. Fixed a bug with registering the plug-in on FileMaker Server. Rewrote and modernized the low level file handling code of the plug-in. Added new Exchange Files script step, which can (quickly) exchange two files on disk. With the checkbox “Allow different volumes” you can even exchange files on different disks. Note that this may take more time. Added new TrFile_ExchangeFiles function, which can (quickly) exchange two files on disk. When you add the switch “-AllowDifferentVolumes” the plug-in also can exchange files on different disks. Note that this may take more time. Added new TrFile_GetFileStructure function, which returns the structure of a movie file. It can analyze a movie file (.mov) and return a list of all movie boxes (formerly known as atoms) in the movie. The movie boxes are indented to visualize the tree structure of the boxes. The result can be formatted as XML or as a more readable list of movie boxes. It can also return the structure of a ISOBMFF (ISO base media file format), for example MP4 or HEIC. Added new switch “-AllowDifferentVolumes” to the TrFile_MoveFile function, which allows the move of the file between different volumes (disks). Note that moving a big file across disks may take more time. Added a new switch to the TrFile_DragAndDrop function: “-ScrollDropZone” to help with the scrolling behavior when you use a drop zone for the drag destination. When you add the switch the position of the dropzone will scroll too when scrolling the FileMaker window. This is also implemented in the script step “Add DragAndDrop Handler” with the checkbox “Scroll the drop zone”. Improved the TrFile_SetMetaData function with the switch “-SetEXIF”. The plug-in is now compliant with EXIF v2.3.1. It writes tags introduced in EXIF version 2.3.1, like LensMake, LensModel and LensSerialNumber and timezone tags. The plug-in also handles these tags: ambient temperature, humidity, pressure, waterdepth, acceleration, sensitivity type, standard output sensitivity, recommended exposure index. Finally the plug-in handles the GPS tag GPSHPositioningError, which indicates horizontal positioning errors in meters. Improved the TrFile_SetMetaData function with the switch “-SetEXIF”. The code has been rewritten and the plug-in now writes EXIF data that is better readable by PHP. Added more tags to be written when using the TrFile_SetMetaData function and the switch “-SetEXIF”: the plug-in now correctly writes the tags: WhitePoint and PrimaryChromaticities. It now also writes tags which are not part of the EXIF specification, but may exist in the EXIF data in some images. This can be tags like ProcessingSoftware or DocumentName. Improved handling of files located on remote volumes like WebDAV. Fixed a problem with the TrFile_Exists function, where certain incorrect paths with double colons would result into a 1 as result. Improved the TrFile_DragAndDrop function so that it works with FileMaker Pro 17. (macOS 10.13.4) Fixed a problem with the TrFile_DragAndDrop function when using the switch “-AllowMailDrops”, where an incorrect path to the temporary email file would be returned. The plug-in now returns the correct path. In some cases the Mail app does not create the temporary email file, the plug-in then returns the complete drag information, which can be parsed to get the correct location of the email. Added example script to the SelectFile.fmp12 example file which demonstrates how to use the switch “-HideInvisibles”. (macOS) The minimum supported Mac OS X version is now 10.8. Improved the example file ManageMedia.fmp12, it now demonstrates how to retrieve metadata from movies (including XMP). Improved the TrFile_GetMetadata function. Added new switch “-SourceUTF8CharSet”, to be used with the switch “-GetIPTC”. The IPTC metadata of the source image file will forced to be read as UTF-8 encoded. Updated the FileManipulation.fmp12 example file to show the TrFile_ResolveAlias function. (Mac OS) Fixed a possible bug in the TrFile_Substitute function, when substituting in place: there are no longer spurious extra characters at the end of the new file when the replace string is shorter than the search string. In the TrFile_Substitute function, when the search string is at the end of the source file the destination now has the correct end character. (Mac OS) Fixed a bug in the TrFile_Substitute function on macOS 10.13 (High Sierra): when you substitute in place this no longer gives an $$-50 error code as result. (Mac OS) Improved the reliability of the TrFile_SetMetadata and TrFile_InsertContents functions on macOS 10.13 (High Sierra). (Mac OS) Fixed a possible memory leak in the TrFile_GetFolderSize function. (Mac OS) Fixed a compilation problem with code signing and extended attributes in macOS 10.12 (Sierra). (Windows) Fixed a bug with the TrFile_DragAndDrop function which prevented drag and drop when running FileMaker Pro 16. Improved the DragAndDrop.fmp12 example file: the calculation for the bounds of the three drag zones are improved when running FileMaker Pro 16. Added new TrFile_GetFolderSize function, which can get the total size (in bytes) of a folder. Added new TrFile_AppendContentsToFile function, which can append text to the end of a specified (text) file. Added new TrFile_SetContentsOfFile function, which can set the contents of a specified (text) file. (Mac OS) Added new TrFile_SetFinderComment function, which can set the text of a Finder comment (also called Spotlight comment) of a specified file or folder. You can see the comment with the Get Info command in the Finder. Renamed the TrFile_MetaData function to TrFile_GetMetaData, as to better reflect its functionality. Added possibility to use a container as the source parameter for the TrFile_GetMetadata function. Improved the TrFile_DragAndDrop function: you can now specify three different drop zones with the TrFile_DragAndDrop function. The File Plug-in adds multiple script steps when running FileMaker Pro 16. NOTE Only steps that perform an action have been added as a script step. Functions that just return information (like for example TrFile_GetFileSize) are only available as an external function. Added new example file CreateFile-for-FMP16.fmp12, which demonstrates how to use the new external script steps of FileMaker Pro 16. (Mac OS X) Fixed a problem with the TrFile_DragAndDrop function when dragging mail: email messages with a semicolon (“;”) in the subject of the email are now handled properly. Updated the Attribute.fmp12 example file. Version 10.1 uses the 10.0 registration code.If you have a license for a previous version, you can buy an upgrade for version 10.x. If you bought a license on or after May 9, 2017, the upgrade to version 10.x is FREE! Note: eligible users have been sent a new 10.0 registration. Contact us if you have not received yours. “We have used a single version of the original Troi File classic plug-in for a several years, converting last week to a 10 user of the v4 version for Filemaker 8+. I was amazed how quick and easy it was to convert our code, as we use the Troi File functionality in about 40 instances across about 15 scripts. “I just want to let you know how highly I think of your product, Troi File. I’ve been developing a commercial solution that makes extensive use of the plug-in. It’s easy to use and most importantly, it’s rock solid. I’ve emailed you support questions from time to time and they are always answered with the information to solve the problem. Randy Lawrence, Absolute Advantage, Inc.
“Two weeks ago I had a very intensive project; full automation of a data conversion routine involving import and export of thousands of files. The Troi File Plug-In (and your very helpful and timely advice) made it all happen and get delivered on time. In the past years of doing FileMaker development the most visionary and extensive projects I have been involved in have used Troi Plug-Ins as an essential component. Troi Plug-Ins give the ability to automagically harness system level processes; the simplest way of describing it is a “Wow” factor on the client’s side and a fundamentally elegant, straightforward, and fast scripting process from the developer’s perspective. They put a powerhouse of programming behind FileMaker’s ease of use. “Troi File Plug-in is a truly great product. I just wish I had looked into it properly when it first came out. If I had known just how powerful this tool was I’d have bought it for all my clients years ago. “Thank you for your new plug-in! I bought it in about 10 seconds after I saw it can do exactly what I have been trying to do with Applescript unsuccessfully. Using Filemaker to organize my cruise reviews, I was looking for a convenient way to export the html to a file. I had been using the legacy Keyquencer to copy and paste information into a text-editor, and then save the file. To update my html files, this would take about 2 hours! Your timing could not have been better. Now I can do the same task in about 2 seconds. Well worth the price of the plug-in! Thanks for all your great work”. “At the recent suggestion of Dana Perry, I took a look at the Troi File Plug-in in the context of testing for the existence of the Adobe Acrobat Reader program (before launching PDF files from FileMaker). My study of the plug-in confirmed for me the great power of this tool for a variety of other tasks, including the automation of upgrades. I developed a routine with FileMaker and the Troi File Plug-in that I thought might interest other users.” Read more about it here. Vince Lackner, The Lackner Group, Inc.
Russell Kohn, Chaparral Software & Consulting Services, Inc.
First, thanks for a great plugin in TroiFile! I’ve been using it to help power a great web site, www.topekamls.com (not available from 4:00 to 4:30 AM CST (GMT-7)). There we are using TroiFile, in concert with some calc fields in FMP, to detect whether a given house listing in our “available properties” FMP database actually has a picture on the hard drive or not, by using the TroiFile GetSize command – if it has a size, it’s got a picture! Saved our bacon for sure, as the database we’re importing the housing data from doesn’t have any kind of field that would otherwise let me know if any given record has an associated picture or not. Many thanks! “From the US side of the pond, I offer my sincere thanks for the work you put into the File Plug-In. I didn’t realize the limitations that are inherent to FMP5 (Win) until I built my solution and found I couldn’t include badly needed features. After being directed to your web site by a fellow developer I downloaded and tested the evaluation copy. Shortly thereafter I purchased the Developer License. James L. (Jay) Knight, Jr., Lead Developer Infotraxx Systems, Inc.
We are still collecting more comments. If you have any remarks on the File Plug-in please send us your comments. Thanks! Some ideas how Troi File Plug-in can help you manage images, movies and other files. How to easily add the icons of files on your disk to your FileMaker app. How to let a user select a file on disk, for example to get the contents into FileMaker. Easily see which files or folders are in a folder. (Older) information on how to convert databases which use Troi File from FileMaker Pro 6 to FileMaker Pro 7 and later. Manipulate any information on your disk directly from within FileMaker!